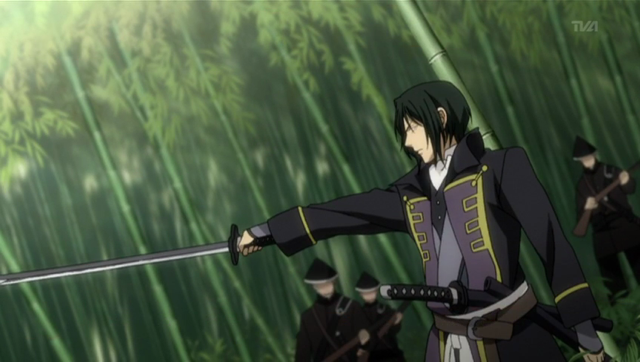 Hijikata leads the attack on Utsunomiya Castle. 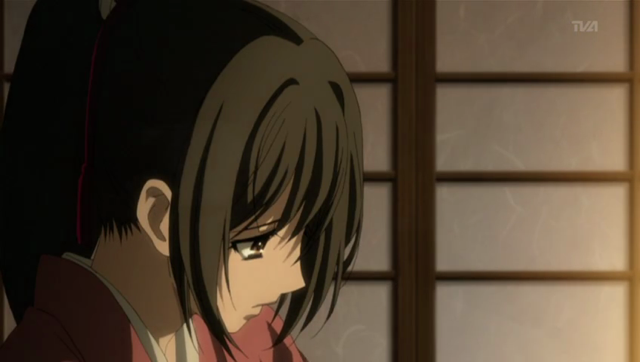 Episode 17 of Hakuouki primarily relates the events surrounding the unsuccessful attack on Utsunomiya Castle. 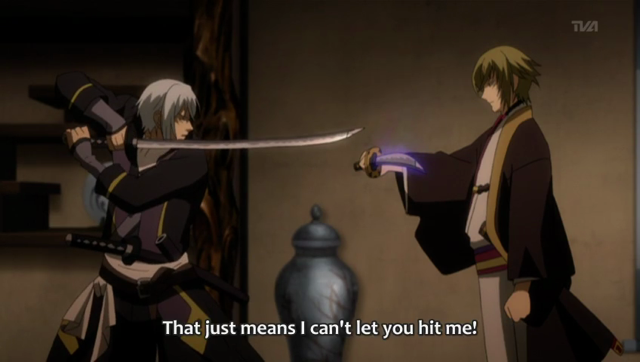 The Shinsengumi are breaking up, but Hijikata vows to struggle on for the sake of his men. Unfortunately he bears not only responsibility for the remaining Shinsengumi, but also the curse of rasetsu, and the enmity of Chikage. Chizuru's bare shoulders become a feeding opportunity. So Sannosuke and Shinpachi are not completely out of the action! 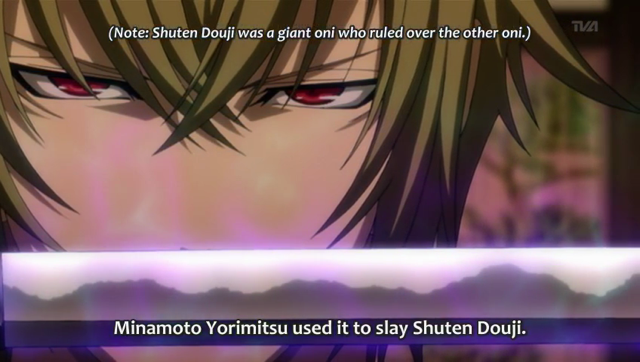 The episode focussed on Hijikata, and his acceptance of the mantle of sole leader of the Shinsengumi, as well as a special counsel for the remaining Bakufu Army on the march toward Aizo. In this context, seeing those two operating gave a sense of the former Shinsengumi leaders assuming greater responsibility, especially in Shinpachi’s interactions at the end of the episode. Hijikata needs blood, and Chizuru seems pretty happy to accommodate. While raiding the castle, Hijikata discovers Chikage who brandishes a sword that belonged to the legendary oni slayer Minamoto no Yorimitsu (also known as Raiko, 948-1021 CE). With all the other stuff going on, you would think a grudge match with a magic-blade wielding oni would be an unnecessary distraction. With everything stacked against him, Hijikata refuses to give in. Though brave, his stand results in serious injury. The Bakafu forces relinquish Utsunomiya Castle, and continue on their march. 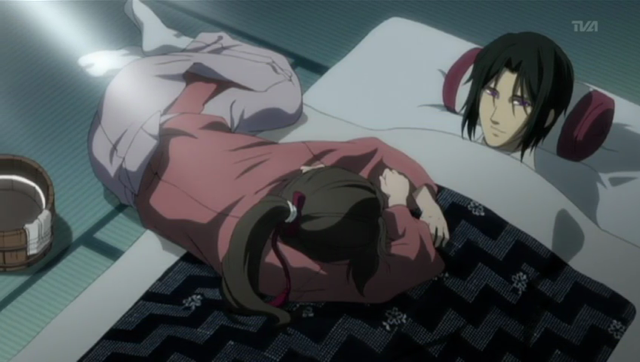 Chizuru cares for Hijikata's wounds. I really liked the section with Shinpachi at the end. There was a lot of joking around amongst the core group at the start of the first season., but for most of this episode, Hijikata was apart from the core group members. 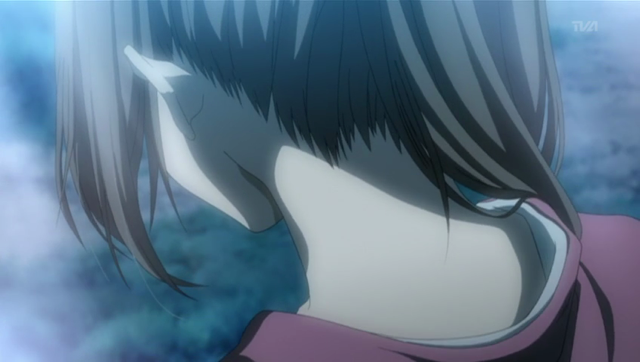 The interaction with Shinpachi contrasted with the isolation in the earlier part of the episode. This series is growing darker… which I guess was inevitable, given the rasetsu theme and the history of the Shinsengumi and their end, but… gah. It is getting dark, but I kind of like that. You don’t see too many tragedies any more. It actually comes off as kind of classy. Of course lots of great Japanese movies are depressing if you think about it. Have you ever seen Double Suicide? It’s just one example, but it is so good.